Jessica Walker stars in THE GIRL I LEFT BEHIND ME, with Joe Atkins on piano, part of Brits Off Broadway at 59E59 Theaters. The 59E59 Theaters comprise one of Manhattan’s most sophisticated and active theatrical venues. It is no surprise then, to find very unique offerings being showcased there for New York’s busy theatre scene. 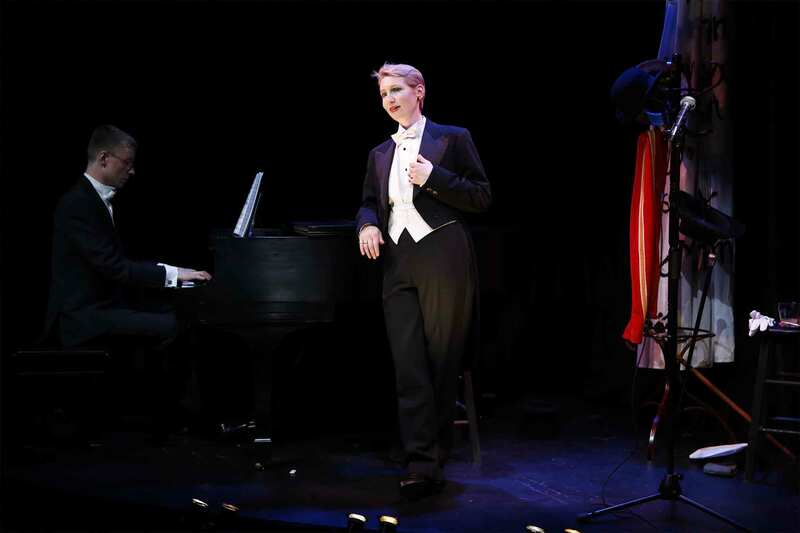 Such is certainly the case with the current limited run of The Girl I Left Behind Me, an unusual one-woman production starring the very vocally talented Jessica Walker in the theater’s third floor cabaret space. A British import, the piece fits in well with the theater’s current series of shows being presented under the banner of “Brits Off Broadway.” Written by Ms. Walker and Neil Bartlett (he also directs the work), the one-act show gives its audience a peek into the little-known world of assorted female vocalists who were known for singing as women while being dressed as men. 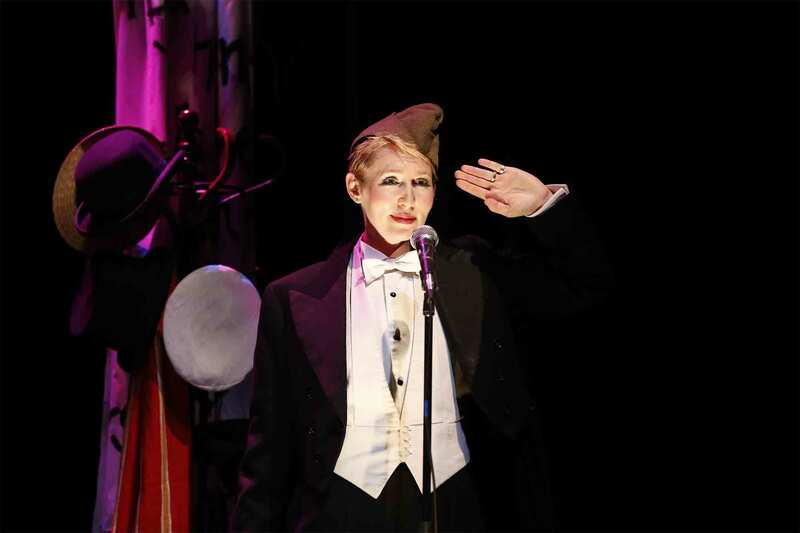 It was a bit of devilish cross-gender trickery that popped up from time to time in the traditions of the English music halls, Vaudeville and beyond. It is a somewhat remote niche of musical performance that is certainly interesting to sample, but with its firmest roots in Great Britain, it may be a bit too remote for satisfactory general consumption on this side of the pond. With that initial thought as a backdrop, I will be quick to point out that the trim and attractive Ms. Walker, smartly dressed in a gentleman’s tuxedo (with an assortment of gent’s hats close at hand) has certainly done her historical homework here in this collaboration with Mr. Bartlett. One senses they have brought considerable scholarship to this examination of a musical form that could easily have fallen through the cracks of the historical record for both the late 19th and early 20th centuries. Serious music students may well enjoy becoming familiar with the genre, and Walker’s rich mezzo-soprano voice is certainly up to the task of recreating the performances of the notable crossover vocalists celebrated in her performance. It should be noted that these women always performed in their own voices without any intention of deceiving the audience about their real gender, male attire not withstanding. One of these was Ella Shields. She was perhaps best known for performing the music hall favorite, “Burlington Bertie From Bow,” a song composed by her husband, and nicely performed here by Ms. Walker. Sadly, after performing that very song on August 3, 1952, Ella collapsed on the way to her dressing room and died that same evening. Similarly, we learn about blues singer, Gladys Bentley, [no known relation to your author], who is described as, “…a six foot, cross-dressing cabaret queen and out bull-dagger,” in 1930’s Harlem. Walker celebrates this artist with a fine performance of “Baby, Won’t You Please Come Home?” Gladys, by the way, was known for, “…her white satin tuxedo, her matching white topper and her girlfriends.” Among her cronies were Beatrice Lillie, Tallulah Bankhead, and the as yet undiscovered, Joan Crawford. For all its interesting historical details, the show is primarily a musical event that is skillfully guided by Musical Director, Joe Atkins, accompanying on the eighty-eight. In addition to the title song, the eclectic song list includes such other tunes as, “I Love the Ladies,” “Jolly Good Luck to the Girl Who Loves a Sailor,” “Angels Without Wings,” “Why Did I Kiss That Girl,” “Following in Father’s Footsteps,” “I’m Sowing All My Wild Oats,” and “I’ve Got the Time, I’ve Got the Place.” There are even brief snatches of classic opera from Der Rosenkavalier and The Marriage of Figaro, and it must be said that Walker’s elegant voice was well prepared for those segments. Occasional “dim the spotlight” cues might help guide a cautious audience to moments when applause is appropriate, and some of the numbers may seem a bit too obscure for contemporary tastes. But a clear audience favorite was the more familiar and beautifully sung, “After the Ball.” Interestingly, Charles K. Harris, the first man to ever earn a million dollars in royalties, composed that latter song, which is sung here in tribute to Miss Tilley. I imagine I was not alone in having that tune linger in my brain long “after the ball” was over. THE GIRL I LEFT BEHIND ME continues through Sunday, May 19th, at 59E59 Theaters, 59 East 59th Street, New York, N.Y. Tickets are $25 ($17.50 for 59E59 Members). For tickets and information call Ticket Central at (212) 279-4200 or visit the website at http://www.59e59.org. This entry was posted in 59E59 Theaters, Broadway, BroadwayStars.com, Concert Reviews, London Theatre, Off Broadway, Theater Reviews, ThePeoplesCritic.com and tagged Broadway, concerts, London Theatre, music, musicals, New York, Off Broadway, opera, plays, Reviews. Bookmark the permalink.